Things that we use every day and are nice to look at we keep on show. Most electronic appliances and random kitchen equipment, like a rolling pin that we use once a year if even then, are stored behind closed doors. 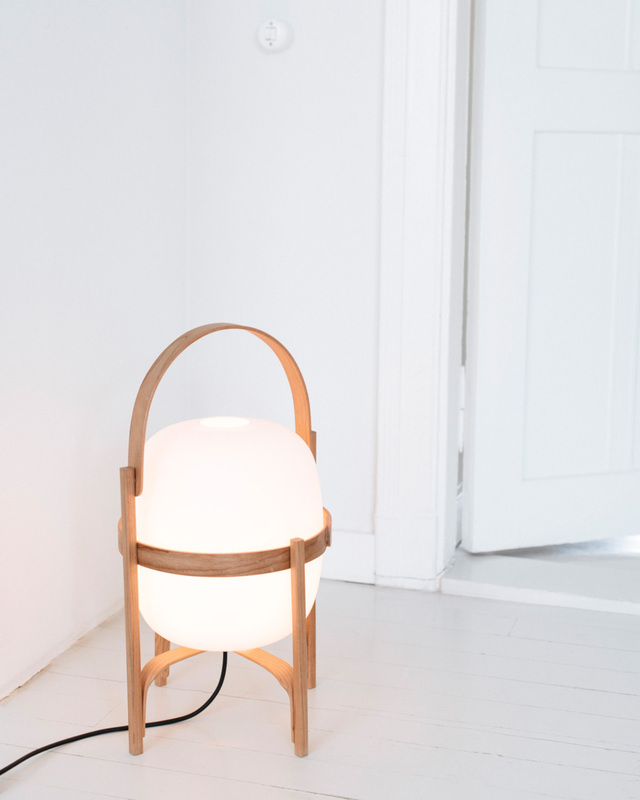 Cesta lamp sitting in the corner. Kitchen is the heart of a home. People and pets alike gravitate towards it. It is where the food is prepared and the conversations happen. We have a combined kitchen and living area which takes up half of the whole apartment. That is where we live and invite our friends to. Lounging on the sofa you can talk to those who are cooking. We have no separate dining room, we eat in the kitchen, around a large table that seats eight. Outside dining hours, the table serves as a work desk for various projects. Most of the cooking stuff and electronic appliances are hidden in cupboards. 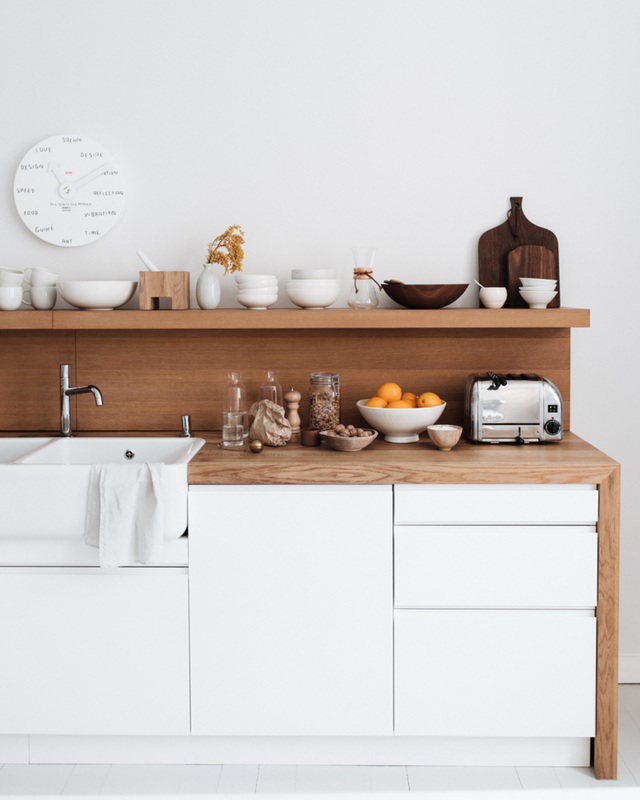 To achieve a balance between ease and beauty, pots and dishes are stored on open shelves and deep drawers instead of cabinets. Along with the equipment I use all the time – good knives and cutting boards, coffee grinder and Pavoni espresso machine, or the classic Dualit toaster that will last your whole lifetime – my single favorite thing in our kitchen is the large sink. Not only is it wide but it is also deep which means that you are able to wash large dishes and fill flower vases with no trouble. It also means that you never feel like you are eating next to a pile of dishes although there are dirty pots and pans left from cooking. Something to improve: knive storing. We still have not found a convenient way to store cooking knives so we keep them in this awkward-looking block of wood where the knives stand upright. It is probably the single most hideous thing in our home. And yet, so refreshing and needed. I can only imagine the relief when it is replaced with a more beautiful solution. Life keeps evolving.